For centuries Tewkesbury was an important market town situated at the confluence of the Rivers Avon and Severn, although it was not until 1826 that the ferries crossing the Severn were replaced by a bridge. During the age of the horse, apart from woollen manufacturers and hosiers, the common tradesmen were carpenters, coopers, farriers, shoemakers, glovers and innkeepers. The Anchor was a hostelry with stables that were much needed in a town which was an important coaching centre. Imagine the thunder of hooves along a cobbled High Street grinding to a halt at the inn for nourishment which was relished by both horse and man. There is nothing left of this era apart from some blue bricks in the back yard. Development and progress bring their toll, for in 1840 the ‘Plume of Feathers Inn’, (locally known as the Feathers), opposite the Anchor was pulled down, leaving only the cellar floors over which the town Railway Station was built. Quay Street, formerly named Quay Lane, with its many pubs was too narrow in 1843 to carry the railway line to the Quayside, so the buildings on the southern side were demolished and the Lane became a Street. The neighbouring inns or ale houses on the north side remained. The ‘White Hart’ until 1891, now ‘Quay Street House’, sells fish and chips. Below was "The Duke of Wellington", named to honour the Army. Next, ‘The Royal Oak’ which was closed in 1917 under the Compensation Act of 1910, is Number 2, Quay Street and was until recent years a picturesque black and white building. Then the "Coach and Horses", until 1876, and on the N.W. comer was ‘The Star’, which at the present day is the milling business offices. The coming of the Railway Age brought more trade and bustle to the town. The Quay Branch line carried horse-drawn waggons until the 1850’s, after which steam traction was introduced, followed by diesel. The trains shared the roadway with vehicular traffic. Across from the Anchor there was a Crossing Keeper with a Red Flag who controlled the traffic in High Street from the Station. The waggons rumbled along to their first stop on the loop sidings at Tewkesbury Brewery on the S.W. comer of Quay Street. This well-kept building, which supplied ale to many local beer houses and inns, is now used by the flour mill. The name Tewkesbury Brewery of Blizard Colman & Co may be seen along with the medallions displaying a hand holding a sheaf of corn on the walls. The Anchor, this impressive square built stone building on the corner of High Street and Quay Street with a massive cellar which leads out under the High Street, held its first licence for selling Cider and Wines in 1774. There were two bars, one public and one a smoke room, with the upper rooms used for meetings and auction sales. Knitting frames from bankrupt hosiers were sold by auction here in 1803. We must not forget the much used ‘Jug and Bottle‘ with its entrance from Quay Street into a very wide red tiled passage with a wooden bench alongside in the recess. Here, many dog owners dropped in for a ‘quickie’ on returning from walks and their four-legged friends were given Adam’s Ale! The large floor tiles, the four rare etched windows, huge mahogany bars and the magnificent Victorian mirrors completed the picture with its brown and cream painted walls. 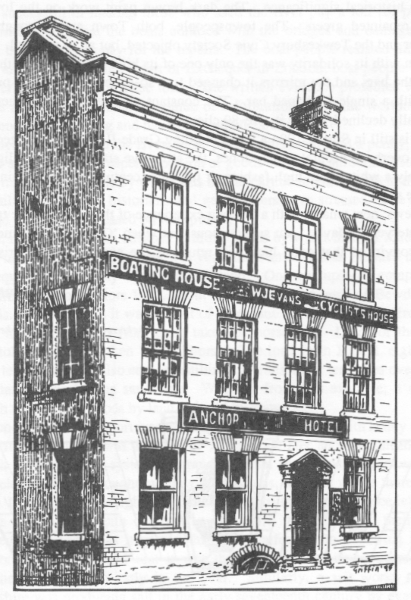 Throughout the years the Anchor Hotel had an excellent reputation. for good ale and a high standard of service. The Cheltenham & Hereford Brewery Co. at Cheltenham owned the Anchor Hotel, which was first listed on the 4th March, 1952 under the Town and Country Planning Act of 1947. Mrs. Gertrude Mustow (widow) was the tenant from 1949 to 1965. She was typical of her time, respected by all, with a warm personality. In 1989 came a sweeping change. Sadly. the vast gilded anchor suspended over the double door was removed. This sign denoted a religious link. the anchor being the salvation of those being swept away on the sea of life. The Hotel was renamed ‘Greens'. and on enquiry this is found to be a name of no historical significance. The dark brown paint work on the lower part of the building was then repainted green. The townspeople. both Town and Borough Councils, the Conservation Officer and the Tewkesbury Civic Society objected. but all to no avail. This Inn with its solidarity was the only one of its kind in town, yet with the removal of the Jug and Bottle, the bars and the mirrors it changed to a so-called modem day pub, covering all the ground floor with a single L shaped bar. The constant change of management did not help Greens and it gradually declined, losing its pre-89 clientele. Greens is still in Spring 1994 a listed building Grade II. The unchanged roofscape and windows with their overhead decorated Keystones, the attractive stained glass fanlight with lantern showing appropriately a white light. high fashion of the 18th. century over the main entrance door-case are all still to be seen. Mary Dauncey; Head; Widow; Female; 45; Hotel Keeper;b. Tewkesbury Glos; Employer. Annie Cooke; Niece; Single; Female; 16; Barmaid;b. Ironville Derbyshire; Employed. Ethel Bush; Servant; Single; Female; 25; Barmaid;b. Oldland --? Glos; Employed. Julie Lane; Servant; Single; Female; 19; General Servant;b. Alstone Glos.